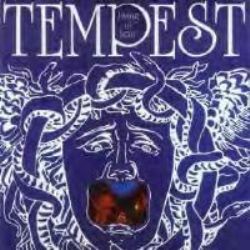 Esoteric Recordings are pleased to announce the release of a newly remastered edition of the second album by TEMPEST, the group formed in 1972 by Colosseum drummer JON HISEMAN. Upon the demise of Hiseman’s previous group he formed the muscular outfit Tempest with Colosseum bassist MARK CLARKE, guitarist ALLAN HOLDSWORTH and Vocalist and Keyboard player PAUL WILLIAMS. Another excellent work, this Esoteric Recordings edition of “Living in Fear” has been re-mastered and restores the albums original elaborate artwork and features two bonus tracks recorded in 1974. The band’s debut album, originally released by Bronze Records in 1973, was a fine work and featured exemplary musicianship from the quartet. By the time of the recording of Tempest’s second album both Holdsworth and Williams had departed. In their place came talented guitarist and keyboard player OLLIE HALSALL.